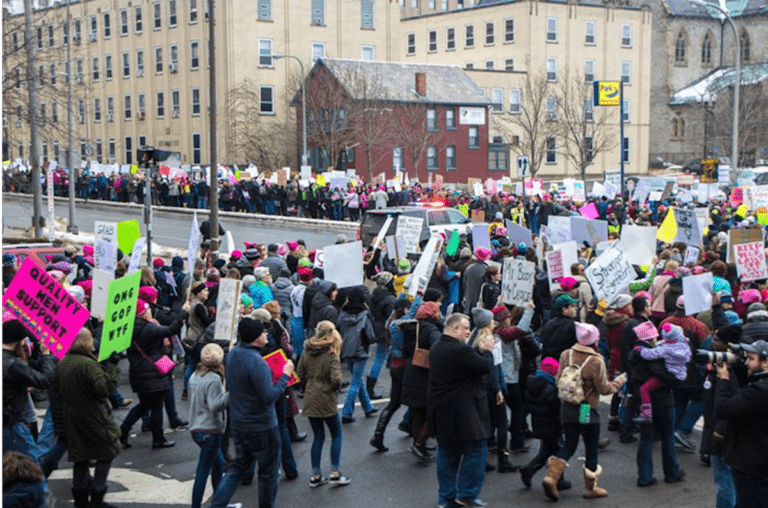 What: The Women’s March – Buffalo/WNY, organized by the WNY Peace Center, brings together the public and 70 like-minded groups and to stand & march together to support women and women’s rights; to pursue local goals; and to oppose all forms of oppression. Local goals on addendum below. Of note: In the event of extremely bad weather, the program will be abbreviated but not canceled. 1199SEIU, WNY Area Labor Federation,AFL-CIO, Activists of Buffalo, Anonymous for the Voiceless WNY, Bee Social, Black Love Resisting in the Rust, Brothers Doing Better, Buffalo Association of Black Social Workers, @Buffalo State Center for Health and Social Research, Burning Books, Bury The Violence, Center for Inquiry WNY, CEJ Buffalo, Community Health Worker Network of Buffalo, Citizen Action Of Western New York, Confident Girl Mentoring Program, Daughters of Creative Sound, The Buffalo DegenderettesEl Buen Amigo & LACA Non-Profit, Food For All, Girls Inspire, Global Justice Ecology Project, Hispanic Heritage Council of Western New York Inc., Hispanic Women’s League, Inclusive Theater of Western New York, Ismail & Company, Indigenous Women’s Initiatives, Interfaith Peace Network, Jewish Voice for Peace Buffalo/WNY, Just Resisting Buffalo- JR, League of Women Voters of Buffalo/Niagara, Inc., Muslim Public Affairs Council, NAACP Buffalo Branch, Nekanesakt/ Buffalo Supports Standing Rock Water Protectors, New Yorkers Against Gun Violence WNY, Open Buffalo, @Organize for Action WNY, NYSUT SRPs, New York Civil Liberties Union – NYCLU, Peace Action – Canisius College, Peace Action New York State, Peacejam Buffalo, Poor People’s Campaign- WNY, Planned Parenthood of Central and Western New York, Push Buffalo, Pretty As A Daisy Mentoring & Enrichment Program, Rahama, Riverside Salem Environmental Cottage, Science Demands Action – Buffalo March for Science, @Sierra Club Niagara Group, Sister District for Western New York, a NYPAN Chapter; StandUp WNY, Stopthe Violencecoalition, Stronger Together WNY, Corp. – Action Together Network, The Subversive Theatre Collective, Survivor Activists of Domestic Violence, UB Gender Institute, Ujima, Unite by Night, Veterans for Peace #128, We Are Women Warriors, WNY Coalition of Peace-Justice-Nonviolence Advocates, @Women against violence Everywhere (WAVE), We Exist Coalition- Buffalo NY, Wild Spirit Education, WNY Media Network, WNY Resistance Revival Chorus, WNY Women’s Foundation, (WNY Peace Center). Many thanks to our 70 wonderful, compassionate, creative, and persistent cosponsors! Facebook event page for the local march: Women’s March – Buffalo/WNY. There’s already >500 going just per Facebook. The program including speakers and youth groups can also be found on the Facebook page, as well as on our website at wnypeace.org. Why: We are uniting our struggles with a women’s wave that will focus on channeling the energy and activism of the Women’s March into attaining local goals in 2019. – More advocacy for women in the healthcare system (measurable goals: address language, cultural and other barriers in the healthcare system, for women of color, women living in poverty and low-income women, and women in general, by: having more doulas in hospitals, more birth education in hospitals, more advocacy in hospitals). – destigmatize and improve access to pregnancy prevention and termination/abortion, and pass the Reproductive Health Care Act which preserves women’s right to choose in NYS no matter what happens to Roe v. Wade nationally. – Providing equal representation to counter-recruit the military, equal access to alternatives to the military; preventing the ‘economic draft’. – Address the disparities and conditions in the Erie County Holding Center, including passing County Law 78 which mandates a professional Advisory Board with teeth for the Sheriff’s Dept. – Increased awareness and actions about Mother Earth, our connection to it, and our dependence on it and the creation. MARCH The march will start at about 3:50pm and proceed up Delaware past the US Courthouse and the Immigration Court, where we need true respect for the Constitution and our Statue-of-Liberty pledge to the world; then take a right onto Mohawk; then right on Franklin, going past the County offices and Old County Hall; right on Church to a right onto Delaware, bringing us past the Erie County Holding Center, scene of dire need and big problems. Map also attached.